Democrat Kyrsten Sinema told the Arizona Republic in 2003 that Americans should "feel compassion" for enemy combatants in Iraq. Sinema is running for U.S. Senate in Arizona against Republican Air Force veteran Martha McSally, who in a debate this week accused Sinema of supporting "treason" for saying in 2003 she was "fine" with people joining the Taliban. Sinema at the time was protesting "against the war nearly every day," according to the Arizona Republic, which interviewed her as an Arizonan who wasn't proud of America for toppling Saddam Hussein's regime in Iraq. "Kyrsten Sinema, a Phoenix woman who led protests against the war nearly every day, didn't feel the pride," the April 14, 2003, article says. 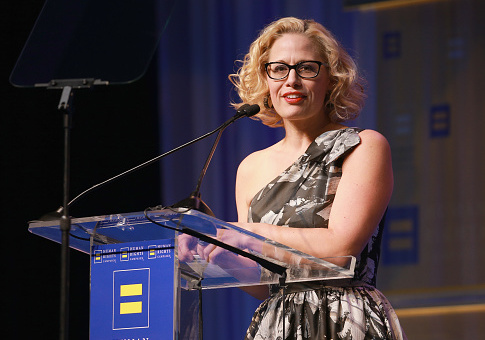 "We should feel compassion for them, too," Sinema was quoted as saying, in what appears to be a reference to both enemy combatants and other Iraqis adversely impacted by the war effort. "People are without water, without electricity, they're still starving and many of them are homeless," she said. Sinema's campaign did not respond to a request for comment on the article, a copy of which was sent to them on Wednesday morning. The McSally campaign has consistently targeted Sinema for her activist past, putting out an ad earlier in the race contrasting images of Sinema protesting with images of McSally in uniform. "While we were in harm's way in uniform, Kyrsten Sinema was protesting us in a pink tutu and denigrating our service," McSally says in the ad. In a debate this week, McSally called for an apology from Sinema for her comments regarding the Taliban, which were first surfaced by CNN. "You said it was okay for Americans to join the Taliban to fight against us," McSally said. "I will ask right now whether you're going to apologize to the veterans and me for saying it is okay—it is treason." Sinema called it a "ridiculous" attack, but McSally continued to hammer her for the comments after the debate. "I was taking shots at the Taliban when I was flying the A-10 Warthog," McSally said after the debate, according to NBC. "This is the definition of treason, saying it's okay for Americans to join our enemies. They're responsible for 3,000 people dying on 9/11, and thousands of soldiers afterwards, and you think that's okay? And she wouldn't even apologize to us for that?" Emails were also revealed this week by the Washington Examiner showing that Sinema invited a "prominent coven of feminist witches" to join one of her 2003 antiwar protests. The emails show Sinema asking the witches to wear "colorful clothing and come ready to dance, twirl, and stay in touch with your inner creativity and with the Earth." This entry was posted in Politics and tagged 2018 Election, Arizona, Iraq. Bookmark the permalink.